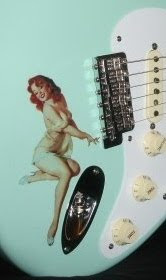 Thaddeus Hogarth- Blues & Funk Boston Strat-o-Brother! Thaddeus Hogarth joins Julien Kasper representing Berklee School faculty in our Strat-o-Brothers Directory. I discovered Thaddeus thru some gear demo vids he's posted. He's into some sweet gear too! Amazon's customer reviews are rave, so if you have felt the need to improve your grooves and soul ornamentation, this could be your book. Born in the UK and raised in the West Indies, this fixture of the Boston music scene is as equally at home soloing Robben Ford style as he is playing Reggae, AND he plays chromatic harmonica in the style of Stevie Wonder and Toots Thielemans. He's even hung out with Toots for some private instruction. Like I said, Hogarth has a lot goin' on! Oh yeah, also check out this VIDEO of his Little Wing orchestra performance with the Boston Horns, based on an arrangement by the late legend Gil Evans. If this is all too much, I'm with ya there. But seriously, check out the book and polish up those funk & soul grooves. The chicks dig that stuff!